“En marche pour l’Elysée” – What does the international press say? The final results are in. Emmanuel Macron and Marine Le Pen have qualified to the second round of the French Presidential elections, the first in the country’s modern History to occur under a state of emergency. The centrist candidate attained 23.8% of the popular vote, ahead of his far-right opponent’s 21,5%. The two mainstream parties in France were pushed to the sidelines, and for the first time in 50 years, they will be absent in the second round, as Conservative leader François Fillon, and Socialist Party candidate Benoît Hamon, obtained 19.94% and 6.35% of the vote, respectively. In fourth place, Jean-Luc Mélenchon brought 19.62% of the votes for the far left. Both Hamon and Fillon have asked their electorate to vote for Macron in the second round, which will take place on May 7. Le Monde hails the meteoric rise of a politics novice in a historic and unprecedented election, during which two ‘Frances’ faced each other: the rurality that massively voted for Marine Le Pen, and the cities which have pledged Emmanuel Macron. The newspaper also expressed that the National Front’s failure in reaching the top of the first round gives a “mixed feeling” to Le Pen’s good result, due to the favorable context. With a headline stating “La droite KO” (the right was KO’d), Le Figaro highlights the fact that several politicians were displeased to see Emmanuel Macron behave as if he had already won the Presidential elections, while reporting, in contradiction, that key figures of the French right are already starting preparations for June’s legislative elections. Singling out François Fillon as the sole responsible for April 23’s defeat, it is commented that the right still believes its ideals to speak for the majority of the French electorate. Público emphasizes the battle between the ‘European’ Macron, and the ‘people’s candidate’ Le Pen, where the language of hope and confrontation are at play for the future of Europe. The newspaper also highlighted the fact that the European Commission and several European governments, including the Portuguese, were quick to congratulate Macron, and wish him success in the second round. Expresso describes last night’s elections as a ‘political earthquake’, and the Socialist and Republican Parties as a ‘field of ruins’, while reporting that the exceedingly favorite candidate Emmanuel Macron has already began efforts to form a parliamentary majority with the right and the Socialist Party. Der Spiegel also prominently features Macron’s need of assuring coalition partners in the left and right in a piece titled “Macrons To-Do-List”. The newspaper also considers that the ‘humiliated’ mainstream parties will find in June’s legislative elections the ‘last chance’ to secure their survival, given the power struggle taking place at the right, and the crisis of existence occurring in the left. 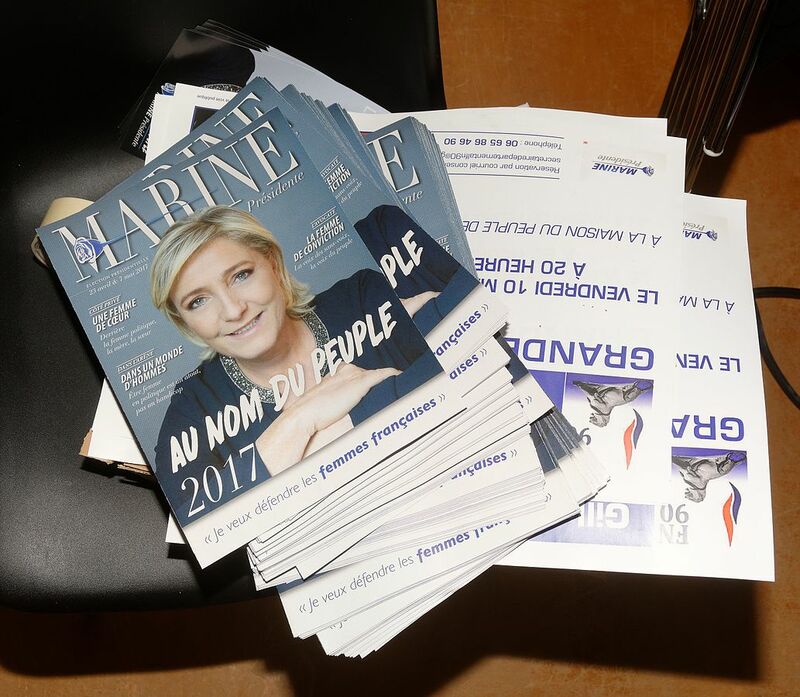 The conservative newspaper, Frankfurter Allgemeine, on the other hand, choses to highlight the two fundamentally different campaign promises of Macron and Le Pen, as well as the right-wing’s poor chances in the second round, in spite of claiming that the National Front candidate may improve her standing among voters if the issue of security becomes viral in the next two weeks. Their headline piece claims: ‘Die armen wählten rechtsextrem’ – the poor chose the right-wing – hinting at Macron’s strong results among the most affluent voters. Conversely, The Guardian offers a more negative view regarding Brexit, stating that Macron described Britain’s decision to leave the EU as a ‘crime’, and reminding his attachment to a “strict approach to Brexit”. Calling the result “a full-throated rebuke of France’s traditional mainstream parties”, The New York Times emphasized the starkly different visions of the two candidates (a ‘political novice’ and a ‘far-right firebrand’) for the future of France. The newspaper also stated that Macron’s success indicates that, “despite multiple terrorist attacks in France recently, a message of outreach to immigrants and acceptance of Muslims, as well as of ethnic diversity, has some currency”. The Washington Post focused more significantly on the European project, tying the result of the May 7 run-off to the future of the EU, and equating the French Presidential elections to a “battle between a contender who wants to seal France tight against the tides of globalization and another who seeks to strip away even more barriers with the rest of the world”. Le Soir opted to feature prominently Paul Magnette’s (Minister-President of Wallonia) criticism of far-left candidate Jean-Luc Mélenchon, who has yet to give instructions to his voters regarding the second run of the French elections. According to the politician, Mélenchon unwillingness to support either Macron or Le Pen “en dit long sur son ego et son ambiguïté” (speaks volumes about his ego and ambiguity). Corriere Della Sera summarizes the March 23 elections as a battle between Europeans and populists, stating the contrast between the hopeful language of Macron, who looks at the future with confidence, and the angry speech of Le Pen, who shouts “On est chez nous” (This is our home). The newspaper also reminds that no other candidate had the courage to stand behind the European project at a time where just about every politician succumbed to the temptation of blaming everything on Brussels, and that the European flags, just as France’s tricolor, became an unexpected and powerful symbol of this historic phase. Finally, El País highlights the fact that the Spanish parties, with the exception of “Podemos”, support Macron in the second round of the Presidential elections in France. Additionally, they report that the Government has come out to voice its support for the centrist candidate, since Macron’s European project resembles its own the most. Photo by Thomas Bresson, CC BY 4.0. ← As eleições presidenciais e a política externa da França: ser ou não ser europeia?